Historically, the social aspects of language use have been considered the domain of social psychology, while the underlying psycholinguistic mechanisms have been the purview of cognitive psychology. Recently, it has become increasingly clear that these two dimensions are highly interrelated: cognitive mechanisms underlying speech production and comprehension interact with social psychological factors, such as beliefs about one's interlocutors and politeness norms, and with the dynamics of the conversation itself, to produce shared meaning. This realization has led to an exciting body of research integrating the social and cognitive dimensions which has greatly increased our understanding of human language use. Each chapter in this volume demonstrates how the theoretical approaches and research methods of social and cognitive psychology can be successfully interwoven to provide insight into one or more fundamental questions about the process of interpersonal communication. The topics under investigation include the nature and role of speaker intentions in the communicative process, the production and comprehension of indirect speech and figurative language, perspective-taking and conversational collaboration, and the relationships between language, cognition, culture, and social interaction. The book will be of interest to all those who study interpersonal language use: social and cognitive psychologists, theoretical and applied linguists, and communication researchers. "This solid contribution to research in the field will be appreciated not only by psycholinguists, but more generally by cognitive and social psychologists as well." "…this text is excellent reading. For scholars interested in interpersonal communication, this book should provide a gold mine of ideas for ways to integrate cognitive and social processes in their research, both methodologically and conceptually." "Traditionally, the study of the social dimensions of interpersonal communication has been separated from the study of the cognitive dimensions. Recent research efforts from both social and cognitive psychology, however, have made apparent the value of integrating both approaches for increasing our understanding of language use. The volume by Fussell and Kreuz is an excellent illustration of these efforts." "…the issues presented prove to be an interesting exploration into the fascinating domain of interpersonal communication and they are relevant enough to trigger debate among scholars….provides a stimulating perspective on how speaker and hearer take into account each other's perspective and how they are cognitively influenced by this perspective-taking." Contents: Part I:Introduction and Background. S.R. 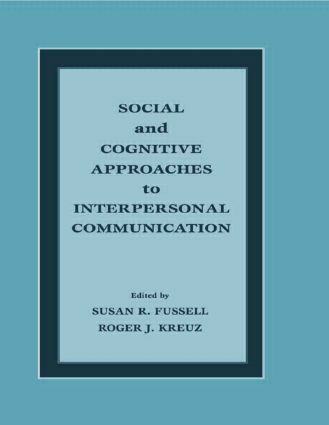 Fussell, R.J. Kreuz, Social and Cognitive Approaches to Interpersonal Communication: Introduction and Overview. R.W. Gibbs, Jr., The Varieties of Intentions in Interpersonal Communication. N. Schwarz, Communication in Standardized Research Situations: A Gricean Perspective. Part II:Indirect Speech Acts and Figurative Language. T. Holtgraves, Interpersonal Foundations of Conversational Indirectness. R.J. Kreuz, M.A. Kassler, L. Coppenrath, The Use of Exaggeration in Discourse: Cognitive and Social Facets. S.R. Fussell, M.M. Moss, Figurative Language in Emotional Communication. Part III:Perspective-Taking and Conversational Collaboration. M.F. Schober, Different Kinds of Conversational Perspective-Taking. B. Keysar, Language Users as Problem Solvers: Just What Ambiguity Problem Do They Solve? S.E. Brennan, The Grounding Problem in Conversations With and Through Computers. Part IV:Cognition, Language, and Social Interaction. G.R. Semin, Cognition, Language, and Communication. C-Y. Chiu, R.M. Krauss, I.Y-M. Lau, Some Cognitive Consequences of Communication.